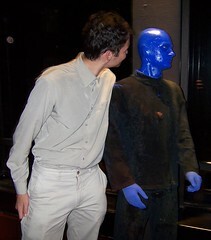 In the last day of Lastguru's visit, I convinced him to go to The Blue Man group performance in the New London Theatre. The performance was just great - a combination of rhythmic music, dramatic light and a hilarious comedy show. Just wonderful! There was a lot of classic Blue Man moments - weird looks, colour-splashing drums, rock concert movements, textual and emotional sketches with the audience and the great "You Are LATE!" intermission. It really was 100 minutes of pure fun. And best of all, on the exit I was given a special ticket with which I can get back in again for free if I bring a friend - yay! For the last couple weeks I have been concentrating on things related to my studies and on some events related to it. I posted pictures from these events on my Flickr photostream: a colleague from the institute finished his PhD and we had a goodbye dinner, my supervisor invited me to his son's first birthday party. Also my friends Bunja and lastguru came to UK. With one I took photos of a night playground and squirrels and with other one some photos of the Eye and Babbage's brain.